Accessories: Accompanied by Rolex blank guarantee. Provenance: Rolex Daytona "Lesson One" 50 exceptional examples of the world's most celebrated chronograph wristwatch, Christie's Geneva November 10, 2013: Lot 29. Literature: "The Krug" is prominently illustrated in Ultimate Rolex Daytona by Pucci Papaleo, pages 444 to 447. Rolex Daytona "Lesson One" 50 exceptional examples of the world's most celebrated chronograph wristwatch, Christie's Geneva November 10, 2013: Lot 29. Displaying a 5.126 million serial number, this wonderfully preserved reference 6263 has most likely never been polished, propelling it into the most impressive levels of collectibility. Its exceptional state of preservation is further underlined by the presence of the original Rolex sticker, which is still partially present on the case back. The combination of green case back sticker, brown registers and gold livery has inspired this watch's nickname "The Krug". 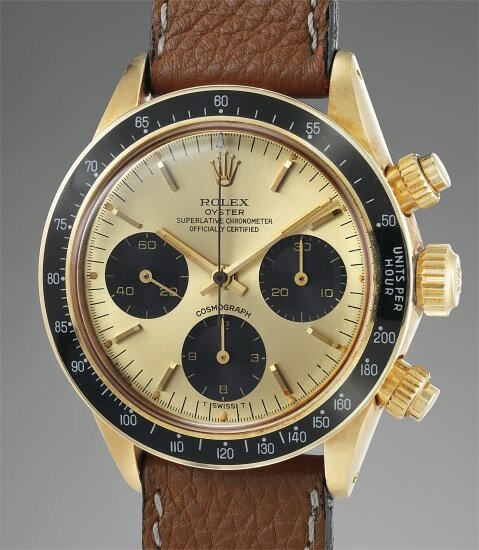 Its provenance is particularly impressive, having been sold at "Rolex Daytona "Lesson One" 50 exceptional examples of the world's most celebrated chronograph wristwatch." Furthermore, "The Krug" is prominently illustrated in Ultimate Rolex Daytona by Pucci Papaleo, page 444 to 447. This reference 6263 most notably features a dial displaying "Superlative Chronometer Officially Certified". During the early 1970s, Rolex began to submit their yellow gold Cosmographs for chronometer certification. While the very first examples displayed an "Oyster Split" designation, later examples, such as this particular configuration displayed the COSC designation directly below "Rolex Oyster". Adding to its charm and desirability, these subsidiary registers have started to become tropical and are turning a deep aubergine tone.